Dr. Rex Davis served as quartermaster aboard LCS(L) (Landing Craft, Support (Large)) 114 near the end of WWII. LCS(L) 114 was stationed at the same radar picket station when USS Drexler (DD-741) was struck by two kamikaze planes on May 28, 1945. 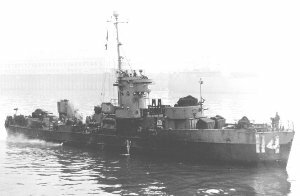 The destroyer quickly sank , and 158 men lost their lives despite LCS(L) 114's rescue of 119 men  from the water. Dr. Davis is a two-time recipient of the Purple Heart. 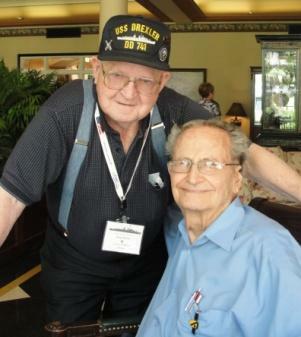 He received his first one in WWII when injured while his crewmates blew up a mine. After WWII, he completed his education and received his medical degree in 1954. He served in Vietnam in 1967-68 as a flight surgeon. While in Vietnam, he received his second Purple Heart. The date was May 28, 1945. We had seen a lot of war since arriving at Okinawa on April 1, Easter Sunday, with the invasion of the island. This was the last island being taken on the way to Japan. We were reporting in to Destroyer #741, the lead ship on this radar picket station to which we had just been assigned. As we approached, she was sharply outlined and life-sized enough to be unmistakably the ship with which we were to work for the next several days. Although it seemed like a routine check-in, the next few hours would prove to be the most awesome event I can remember. But right now the scene was one of spellbinding beauty with the seas enchanting and the daybreak breathtaking. This warrior of the seas was inviting us to join in her war-making prowess. There was another destroyer on this radar picket station, but I didn't notice her as I was admiring the Drexler. A destroyer has several gun tubs bristling with twin 5-inch guns, along with several twin 20mm and 40mm guns. On the aft deck the torpedo tubes and depth charges were part of her fighting might. A destroyer is usually 350 plus feet in length, about 40 feet wide, and very maneuverable for her size. She has a complement of some 350 aboard including 22 officers. Our ship, a landing craft called LCS #114, was 158 feet in length and about 28 feet wide. We had 6 officers and 65 enlisted men aboard. However, being flat-bottomed and drawing but 5 feet of water without a keel, the bow actually pushed water in front of it. This slowed the ship's speed, so that at "all ahead standard," she lumbered along at about 5 or 6 knots. In the middle of the ship behind the second tub of twin 40mm guns was a tall round conning tower with an open well on top, where the captain and his staff held command and control. Our LCS(L) (Landing Craft, Support (Large)) had some might. There were numerous forward-facing racks of 120 rockets in front of the forward twin 40mm gun. The rockets along with two twin 40mm guns, 4 tubs of 20mm guns, and a single 40mm gun over the bow made our little ship a powerful "Mighty Midget." It was an ideal ship to complement the larger destroyers on the radar picket stations. I searched the horizon and found the other destroyer bearing about 030 degrees off our bow, and to the left at some distance were LCS #55 and #56. LCS #52, which we were replacing, had already departed. Thus, this radar picket station would have a full complement. With more ships available, the radar picket stations were getting more muscle. CAP, Combat Air Patrol, was flying over the station. These were sleek new gull-winged Corsairs, a real fighter with a tremendous engine that drove a four-bladed propeller. We had been assigned many times to this most dangerous of all the radar picket stations around the island of Okinawa. Radar Picket Station #1 had been "in the slot" or "coffin's corner." Our skipper had taken us there often and had stayed a long time, but we had not been hit yet. This time it was called Radar Picket Station #15 modified, or #15-A. The station numbers had been changed, but Radar Picket Station #15-A was old #1, north of Okinawa about 50 miles in a direct line from Japan. We went to General Quarters. My General Quarters station was topside recording the action as it took place. We were tense, since there were many Kamikazes in today's fray. We used the terms Kamikaze or suicide plane interchangeably. But to the Japanese, Kamikaze was not suicidal but a divine thing. The activity around the lead ship, the Drexler, alarmed me since there were too many planes in her vicinity. From our distance the difference between friend and foe was not distinct, but something was going on with a beehive of activity all over the radar picket station. I could see that our leader, the Drexler, was being attacked by twin-engine bombers and that the other destroyer and LCS ships were maneuvering to better their positions to defend and fire at these suicide planes. At the same time the Navy Corsairs were chasing the Japanese planes trying to down them before the Japanese bombers could suicide into a ship. Initially, the Kamikaze pilots would go after the larger ships, and early on they were not after the smaller ships, but we had this respite for only a short period of time. When the Kamikazes missed their mark and could change direction or when their time was running out, then we were targets. If there were lots of suicide planes, then they would also line up on us. Several "small boys" had been sent to their grave during the Battle of Okinawa. Suddenly the Drexler took a hit. A twin-engine bomber had been shot up but made it through. Veering wildly and burning, its suicide run was almost a stumbling run into the Drexler and paralyzed her. As she let her troubles be known to us, we whipped our ship into more speed. The Captain ordered, "All ahead full." It became apparent that LCS #55 and LCS #56 were too far off to the side to be of assistance , and the other destroyer had also distanced herself, so we were closest to the ill-fated Drexler. She was now being dived upon by another twin-engined bomber that was being chased by two Corsairs. As the bomber was about to consummate its dive into the Drexler, it missed the mark. It overflew and was so low that it looked as if it were doomed to splash into the sea. But it did not as it barely skimmed the water. Then it rose and turned to the left. The Corsairs chasing it were going too fast to follow the turning bomber. The Japanese pilot maneuvered skillfully, and it was evident to us who had seen many Kamikaze dives that this was no new untrained pilot. He flew his plane into a vulnerable area, aft of amidships in front of the torpedo tubes. All exploded as the suiciding aircraft hit the Drexler, sending part of the opened-up ship into the sky, while most of the ship parted and opened up to the seas. Initially the Drexler was obscured by a cloud of smoke. I had noted the time when hit, and when again visible, the bow was up and going down fast. In 49 seconds from being hit by the second Kamikaze, she was gone ! The Captain bellowed, "All ahead flank." The ship shuddered as it lunged forward with everything we could get out of our diesels, but the vibration was so intense we had to reduce the engines. It sickened me. I felt weak and helpless about wanting to move faster. This little ship, a flat bottomed pollywog that pushed more water than it passed over, could not move fast enough. We were all terribly annoyed and anxious. Emotions overtook all of us, and I was probably worst of all. At first there was no fire and no smoke. From where we were we could not see the crude oil floating on the surface. When the Drexler slipped beneath the waves, it released its fuel. It spread out on the surface of the water and formed a donut of heavy goo. The Drexler sailors that swam through it choked and gagged, but they were the lucky ones. There was soon a raging inferno, a donut of flames. As we neared the scene, this huge donut of flames, probably a mile in diameter, surrounded the area where the destroyer had gone down. Inside the flames we could hear men shouting and screaming. We soon had so many swimmers from the Drexler that we were afraid to move for fear of hitting men in the water, sucking them through our propellers, or causing waves that would drown the weaker ones who had no life vests or other flotation. Drexler's men still in the water were yelling and screaming to be picked up. We were compelled to try to get through the flames to the men inside the fire. They would perish in the flames or be suffocated by smoke, and they had a good probability of drowning. It was a terribly agonizing scenario. But we could not get through, since it became too hot. While we were at "all stop," we began again to rescue floating Drexler crewmen. Those with enough strength climbed the chain and rope ladders we had over the side. One of the survivors who came up to the conning tower was Captain Wilson of the downed destroyer. He greeted our skipper and gushed out his story. As he was sliding down the side of his ship, his binocular straps caught on something, and he could not pull them loose. In a frenzy, he tried and tried to loose the straps. Then he suddenly remembered his combat knife, which he used to cut through the leather straps. He had to swim hard as the ship went down with suction. He laughingly told us his story, but he was shaking and jittery not only from what he had been through but also because he was injured. Some of our men dove into the water to help. They took lines with them in their teeth or wrapped around their body. You can drown with your clothes on, and even experienced swimmers become weighted down and lose control. The circumstances made heroes this day. The first man to enter the water was Shumar, our Boatswain. He surprised us, but he was diving in to save some of these tired-out Drexler sailors. He was not the type to do something like this for a medal or acclaim, but rather he did it because he thought he ought to since he was an excellent swimmer. As he was ready to dive, he pushed in a couple of his nearby mates with the words, "Let's go, those guys need help." But Shumar almost lost his life that day. Seaman First Class Kellogg lowered a small boat and picked up the ones he could reach, some floating but others floundering and drowning, many too weak to climb over the boat's side, so he had to use all of his strength to pull them into his boat. Some of our life rafts were cut loose to aid the ones nearby. Drexler men were everywhere in the water. We got the ones with lines out back aboard so we could make a run at the flames. With our fire hoses spraying a wedge to the front, we tried to get inside. But we could not make it, since the fires were too hot for our ship loaded down with fuel and ammunition. So we backed off, lay fallow in the water, and resumed rescue efforts. Shumar went back into the water for the second time, working with sailors who were further out. His strength was enormous. Again the screams of men inside the donut of flames were heard. It was a suffering agony to not be able to get to them. Presently it looked like the fire was abating some, so we got ready to try again to penetrate the ring of flames to get to those trapped inside. We made another run at the flames, but again we had to give up. The fire was still too hot, and we would explode if we stayed. We were bewildered and frustrated, but we had to back off. After a little while it looked like the flames were receding, and we could see that men were still inside. We would try again. Shumar was some distance away, so the Captain called to him on the loudspeaker that we were going to try again. He asked Shumar, "Can you hang on? We're going to try again." Shumar was alone in the water except for the man he was holding up. Through his binoculars the Skipper saw Shumar motion to go on, and we got underway towards the flames. As I watched our pulling away from Shumar, I remembered an ordeal I had in the water, and it made me shudder. I did not know why then, but this caused me a great deal of consternation, and suddenly a great fear gripped me. Then I went through a transformation of my feelings toward Shumar, who I had hated from the first. What if Shumar couldn't hang on? As I hearkened back to my own near drowning, I was in a terrible turmoil with my feelings. I could see Shumar in the distance, alone as he held up a man from the Drexler. It was so disquieting to me that my emotions went rampant, and I was babbling and muttering to myself. I found myself praying silently, "Oh Lord, please don't let anything happen to this man that I have hated so long." As we attempted to get through again, our ship's maneuvering made me lose sight of Shumar. I was frantic, and I could no longer hide it. But again we could not get through and would have to let the flames die down completely. We had to get back to Shumar. We were all worried and thinking about him as I muttered, "That jerk, that guy who I have hated so much. We got to get back to Shumar." Men on the conning tower who knew our relationship looked at me quizzically. I even told them about my weakness in the water and was almost crying. I was embarrassed. Half laughing and half crying, I bellowed, "Hang on Shumar, we're coming back." No chance that he could hear me, but the Skipper had waved to him as we headed back to pick him up from the sea. As we came to where we could pick him up, I dashed down from the conning tower to where he would come aboard. Shumar was terribly weak, and it was a wonder that he made it. But he made it back aboard with the man he had helped, the 119th from the destroyer Drexler who we had rescued from the waters . There were no more men inside the ring of smoke when the fire died down. They were gone. We knew that many had drowned, burned up, or went down with the ship. But we had Shumar aboard. "Thank God," I uttered. "Thank God." Shumar snickered at me, "Hey Dave , what's the matter?" I turned to run back to my job. He had seen my emotions and grinned as I hastily departed for the conning tower. But I looked back and saw him as he sauntered away in the other direction. I knew I had to say more, so I ran after him and slapped my arm around his shoulder. He grinned that half grin with the drooping eye as he mocked, "Were you afraid for me, Dave?" I choked a little as I said, "Well, yes, what the hell, we need you." He looked at me seriously and said, "Thanks, Dave." As I walked away smiling, I knew that we were now friends. What a blessed relief to have this transition: at first bitter enemies, then my fear for him, and now friends. Again I silently prayed, "Thanks God, thanks for all of this." The men who had worked so hard to rescue Drexler men received awards. Kellogg was promoted to Coxswain along with an award. Shumar was decorated with the Bronze Star, although I think that what he did was worth the Medal of Honor. He was the bravest man I ever knew. 1. In an interview Davis explained that he had responsibility in the LCS(L) 114's conning tower for observing and recording battle action. He measured with the conning tower clock that it took 49 seconds from the time the second kamikaze plane hit Drexler to the time that the destroyer sank. 2. The Deck Log of LCS(L) 114 indicates 120 Drexler survivors were picked up (Brown 2007, 125). However, the Commanding Officer LCS(L) 114 mentions "119 or possibly more" in a 1991 speech (Brown 2007, 130), and Davis also uses the figure of 119 men in his story. 3. The Deck Log of LCS(L) 55 indicates that the ship started to take aboard survivors at 0745, about 40 minutes after Drexler sank, and picked up a total of 30 men (Brown 2007, 127). The Deck Log of LCS(L) 114 indicates that LCS(L) 55 and 56 commenced picking up survivors at 0730, whereas LCS(L) 114 started at 0721 (Brown 2007, 125). 4. See Note 1 regarding measurement of 49 seconds. 5. Dave is short for the author's last name of Davis. Brown, Charles D., comp. 2007. Historical Review: U.S.S. Drexler DD-741. 4th ed. Privately published.